REMINGTON ACR ADAPTIVE COMBAT RIFLE – One rifle. Many missions. The revolutionary, fully-modular Remington® Adaptive Combat Rifle (ACR®). The ACR® was initially conceived to provide today’s warfighter an American-made, reliable, accurate and mission-configurable rifle. Three American companies – MagPul® Industries Corp., Bushmaster® and Remington® – shared this common vision, and after multiple iterations of torturous testing only the strongest materials, components and concepts survived. The ACR® can change calibers from 5.56mm to 6.8mm to .300 AAC Blackout™ in minutes at the user level by changing the bolt head, barrel and magazine. The ACR® can also change barrels, stocks and accessories to go from a close-quarters battle platform to a designated marksman platform. 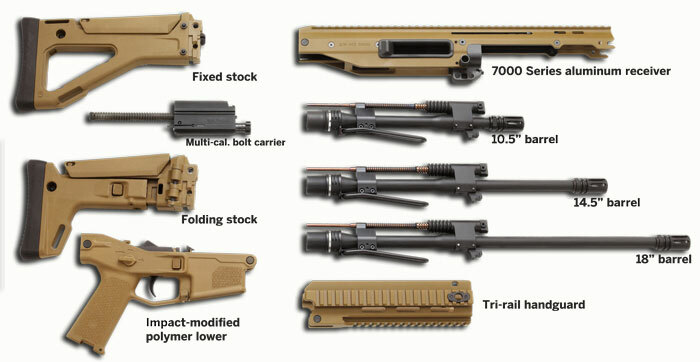 Add a superbly reliable gas piston operating system, controllable full-auto fire capability, a non-reciprocating bolt handle, a monolithic free-floating rail system and intuitive, ambidextrous controls, and you have a platform that is a natural fit for any operator and gives him all the options he needs. Made in the USA for government sales by the oldest name in firearms and ammunition – Remington® delivers again. BOLT ASSEMBLY » Multi-cal bolt assembly quickly and easily changes from 5.56 NATO to 6.8mm to .300 AAC BLACKOUT™ • Forward-mounted charging handle can be switched within seconds from left to right side of the upper receiver and is non-reciprocating during firing. QD BARREL SYSTEM » Available with a quick-detach barrel system that allows operator-level changes of barrel length and caliber. LIGHT-WEIGHT BARREL NUT » Redesigned barrel nut provides more rigid mounting for improved accuracy and consistent POI while allowing replacement of a complete barrel assembly with a single torque wrench in minutes. REMINGTON ACR-PDW™ » Ultra-compact 19.75″ length with stock folded allows unmatched concealability while optimizing barrel length at 9″ for maximized energy on target out of a small package. Bushmaster ACR Black Basic State Compliant Configuration -The first of its kind, and the only rifle you need to master the infinite number of extreme scenarios you’ll face in the worlds of law enforcement and personal defense. Our new Bushmaster ACR redefines the term “modular“ with the extraordinary ability to change calibers, barrel lengths and stock configurations in minutes – without the use of tools. Truly the most versatile and adaptive rifle ever conceived, it was born of a collaborative effort between Bushmaster, Magpul® and Remington® to create the ultimate military combat weapons system. We’re proud to unveil the evolution you see here – built specifically for our law-enforcement and commercial markets. It’s tested and proven reliable in the most brutal conditions on earth, truly ambidextrous and the uncompromising choice when you demand a rifle as mission-adaptable as you are. The Bushmaster ACR. 6-30-2009 – In an email acquired by firearm blog Magpul customer service had this to say about the ACR. 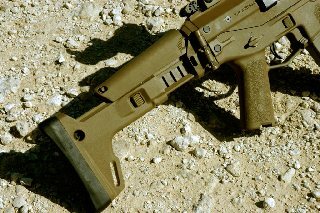 “The Magpul Masada design has been licensed to Bushmaster Firearms and they are handling production and distribution. 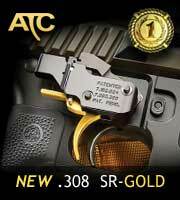 It’s been renamed the ACR and was officially scheduled for release in the first Quarter of 2009. However, Bushmaster/Remington plans on offering up the ACR for the M4 replacement solicitation. This is necessitating some possible small design changes (barrel life requirements, rail markings, position of full-auto safety, etc.) to meet certain mil-specs along with much more scrutiny in the testing process. Unfortunately this will most likely delay the release an undetermined amount of time but we are hoping it will be unveiled sometime late this year with a retail of around $1500. 7-22-2009 – We have noticed the Remington Military site is functional and not a redirect to the traditional Remington Firearms site. More importantly they have a Remington ACR product page here. According to Adam Heggenstaller of Shooting Illustrated who is at Remington’s new products meeting in Texas, the Remington ACR for civilians is scheduled to be hitting shelves in the first half of 2010. “Bushmaster, finally, will offer a consumer version of the ACR in 2010. Several, actually. That was the bottom-line word delivered yesterday at the company’s new products seminar held in Kerrville, Texas. The ACR, or Adaptive Combat Rifle, has been an ongoing collaboration involving Bushmaster, Magpul and Remington for the past two years. A quick rundown of features includes: a two-position (suppressed and non-suppressed), short-stroke, gas-piston system of operation; modular, interchangeable bolt heads, barrels, magazines, buttstocks (one of which is a six-position side-folder) and handguards; an aluminum upper receiver and a polymer lower receiver; a cold hammer-forged, free-floating barrel; and ambidextrous controls. In short, it’s innovative and badass. The cool thing here–other than it being a brand-spanking new gun that you can get your hands on real soon–is the ACR’s modularity. The consumer version will be offered with a 16.5-inch barrel, but Bushmaster will also be making barrels with lengths of 10.5, 14.5 and 18 inches. The first version of the ACR will be chambered in 5.56×45 mm, of course, but since a tool-less disassembly allows you to change bolt heads, barrels and magazines, the ACR can be user-configured to run with other cartridges as well. Ongoing development will focus on the 6.8 mm Rem. SPC, 7.62×39 mm, a yet-to-be-disclosed 6.5 mm round and, get this, the .30 Rem. AR. When these components become available, swapping them out should be a cinch. I watched as the ACR was broken down into its six main components in about a minute. In an update posted to Bushmaster’s website, the company says it is putting the ACR through every imaginable scenario to ensure that it’s absolutely ready to be released and that the official launch is slated for the first half of 2010. In the meantime, feast your eyes on a few pics I snapped at the seminar. And yes, I shot it. At 10 zombie targets as fast as I could. with much controversy regarding configuration, design and costs. Bushmaster has publicly responded at ARF.com Below is the text of that response from Jarrod McDevitt of Bushmaster. Let me remind you all this forum is for product questions & to share info on your existing BFI products. If your intention is to just come in here and randomly use profanity and bash products, your post will be reported to AR15.Com Staff and deleted. I’m all for talking about product and taking criticism, but the majority of this re: the ACR is over the top and unacceptable. If I missed something, I’ll come back in and answer what I can. 1st Topic M4 Bbl: M4 profile was picked as a trade-off between weight and durability. We tested up to 6 bbl profiles (hvy, med, light, heavy under the handguard M4, M4, and fluted hvy). We found that the M4 offered the best weight/performance ratio. 2nd 1×9 Bbl Twist vs. 1×7: 1/7 bbl assemblies will be offered. BFI did 1:9 bc tests show that for 62 gr and under it was more accurate than 1:7. However, 1:9 does not stabilize 77 gr and above as well, so for customers requiring a. 1:7 it will be offered separate and installed in the rifle late spring. 3rd Civ weight vs. Mil Version: The Mil version is still under development and weight reduction to 7lbs. is part of that process. When completed, application of those design changes and the use of alternate material components can be applied to the civ model. 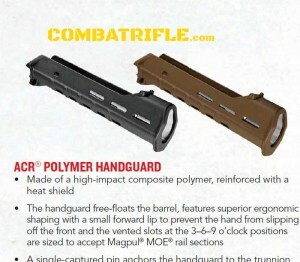 4th Chrome lined vs. New Proprietary Coating: Many have pointed out that the ACR barrels are not chrome lined and that is correct… They are not. That does not mean that they are not coated. As stated in our original press release the ACR barrels, and all internal components, feature a new, proprietary coatings that are substrate conversions which vastly increase durability, lubricity and reliability. 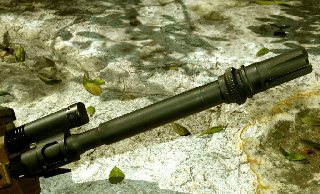 5th Pricing: To make this weapon combat ready, and suitable for LE application and Civilian sales, it went thru revision after revision after revision. The ACR is not an inexpensive rifle to produce, it is of the highest quality and we are utilizing the most advanced materials available. The $1500 Retail price tag was not realistic. I know we all wanted to produce and offer this weapon for under $2k, but when the cost roll up is done, and all the pricing is tiered the realistic $’s are what we are showing. 6th BFI Targeting Modern Warfare Consumers Absolutely not, especially when a large demographic playing this game are youth and we are very careful not to market to individuals who are not legally able to own a firearm, especially youth. We commented at the show on the phenomenon Modern Warfare 2 has caused, bringing the awareness of the ACR to an entire segment of the population that was previously unaware of it. But this product has never been targeted specifically to the players of video game. Our target, as it has been and remains, are professional firearms users, tactical firearms enthusiasts, target and competition shooters, and recreational shooters who value high quality, performance firearms. Lastly, replacement bbls, buttstocks, forends, and caliber conv kits will be offered. We are setting up our accessory/spares program, and will release more info on this as we get closer to the offering. They do not accept a std AR Bbl. However, spare bbls will be offered. We did show the A-TAC Camo version at Shot, it will follow shortly after the release of the Enhanced ACR. We will be offering the 6.8, 7.62×39, and 6.5. No other trigger option avail..this one is pretty sweet. Enhanced model does not go with an additional hgd, will go with the 3 rail only. Basic hgd will be offered separately. March 1 2010 is the official date that the Remington Bushmaster ACR will be available. The rifle was originally named after the Siege of Masada. Magpul company literature about the rifle states that, Magpul Industries is not Jewish owned or Israeli backed, however Magpul has always found the story of the Masada as a bold example of defiance. When production rights were signed with Bushmaster, the Masada name was dropped from the product. 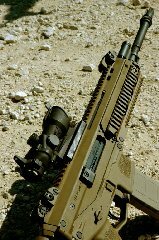 The Bushmaster Adaptive Combat Rifle (ACR) is the production name for an updated version of the Masada Adaptive Combat Weapon System. In late January 2008, Bushmaster entered into a licensing agreement with Magpul whereby Bushmaster would take over production, future development and sales of the Masada. It is a patent pending self-loading rifle platform designed by Magpul Industries of Erie, Colorado. The rifle was initially developed over a period of four months, completely independent of government funding. Prototypes were displayed at the 2007 SHOT Show in Orlando, Florida. Originally scheduled for release in the second quarter of 2008, Bushmaster announced on May 16, 2008, that the consumer release would be delayed until Q1 2009, due to a focus on military projects. On November 18, 2008, Bushmaster released a statement saying, The ACR is being redesigned to be a superior offering to compete for the next generation US Army infantry carbine and subcompact weapon requirement and will be available to select customers in 2009. The ACR was one of the weapons displayed to U.S. Army officials during an invitation-only Industry Day on November 13, 2008. 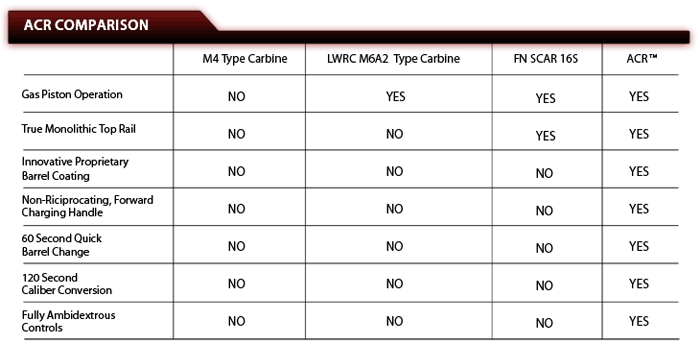 The goal of the Industry Day was to review current carbine technology prior to writing formal requirements for a future replacement for the M4 Carbine. 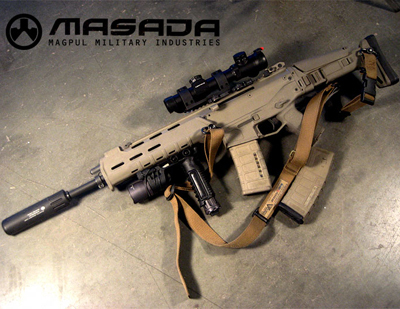 The original Magpul Masada design represents an amalgamation of several recent rifle designs, incorporating what is considered by its designers to be the best features of each in a single, lightweight, modular rifle platform. Design features from the Armalite AR-18 (short-stroke gas system), the FN SCAR (upper receiver, charging handle location), the Heckler & Koch G36/XM8 (liberal use of polymer components), the M16/AR15 (trigger pack), and the M16 (barrel, fire control group) are clearly prevalent. The rifle also includes several features developed by Magpul, such as a quick-change barrel/trunnion system, adjustable gas regulator, non-reciprocating charging handle, and storage compartments located in the stock and grip. Just prior to the deal with Bushmaster, Magpul made additional changes to their design – the most obvious of these is the relocation of the ambidextrous operating handle to a forward position (somewhat similar to the Heckler & Koch G3 and Heckler & Koch MP5 series of weapons). Experts from Magpul Industries have on several occasions mentioned that depending on the barrel length of the weapon, the rate of fire is estimated to be in the range of 600-800 rpm (this is an estimate; specifics have not yet been verified). Bushmaster Firearms, with the help of Remington Arms (a sister company in the Freedom Group, Inc portfolio that includes Bushmaster, Remington, Marlin, and DPMS Panther Arms brands) has also made some design changes based on extensive environmental and functional testing specifically to meet the emerging requirements of the US military in both the carbine and subcompact weapon versions of the ACR family. 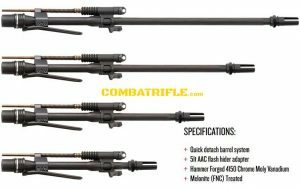 It is expected that the rifle will be offered to military customers in 5.56mm NATO, 6.8 Remington SPC, and 6.5 Grendel with the same lower and the user just having to switch out the barrel, bolt face, and magazine to change calibers. It is also expected that the ACR will have barrel length options of 10.5″, 14.5″, 16″ (commercial), and 18″. 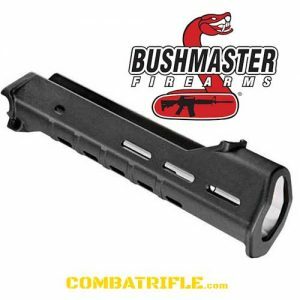 The magazine conceived for the 5.56 mm version of the Bushmaster ACR rifle is called the PMAG, a high-impact, 30-round polymer magazine claimed by the manufacturer to be significantly more resistant to wear, shock, and harsh environments than other counterparts on the market. The PMAG is STANAG 4179-compatible, as it will readily fit any STANAG magazine firearm, including the M16 rifle family. The Bushmaster ACR’s modular construction even allows the user to fire the 7.62x39mm round with a alternate lower. There are rumors that REMINGTON DEFENSE will be displaying an updated version of the ACR at the Association of the United States Army October 10-12. If we here anything we will post it. If any visitors have information please contact us via the contact page. 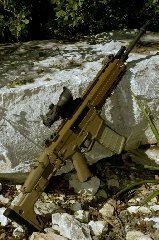 Here is what we now know of the updated REMINGTON ACR. 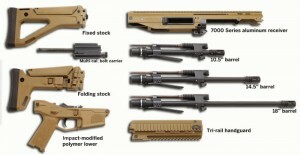 The folding collapsible stock has been replaced by a collapsible only stock. 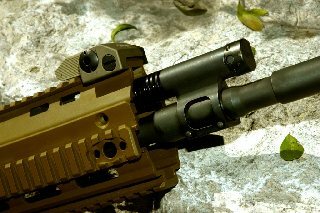 The ACR now accepts standard AR-15 pistol grips. Barrel changing “Fork Tool” has been replaced by a spanner wrench. 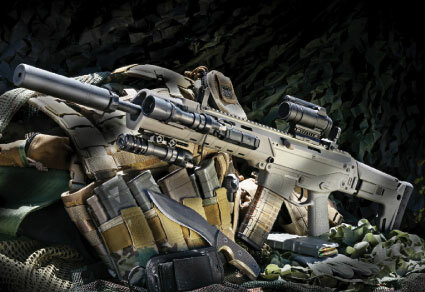 The revolutionary, fully-modular Remington ACR (Adaptive Combat Rifle). The ACR was initially conceived to provide today’s warfighter an American-made, reliable, accurate, and mission-configurable rifle. Three American companies MagPul Industries, Corp., Bushmaster, and Remington shared this common vision and after multiple iterations of torturous testing only the strongest materials, components, and concepts survived. The ACR can change calibers from 5.56mm to 6.8mm to 6.5mm in minutes at the user level by changing the bolt head, barrel, and magazine. The ACR can also change barrels, stocks, and accessories to go from a close-quarters battle platform to a designated marksman platform. Add a superbly reliable gas piston operating system, controllable full-auto fire capability, a non-reciprocating bolt handle, a monolithic free-floating rail system, and intuitive, ambidextrous controls and you have a platform that is a natural fit for any operator and gives him all the options he needs. Made in the USA for government sales by the oldest name in firearms and ammunition Remington delivers again. Weight – 14.5″ bbl 7 lbs. Trigger Pull – 6.25 lbs. The Skinny with Mers and special guest Rachel: Remington ACR and AAC ACR-SD from Advanced Armament Corp. on Vimeo.